At last. Back to work with PMC. I feel like I’ve been away from my studio for a long time. Last week I finally started to get back into the swing of things. 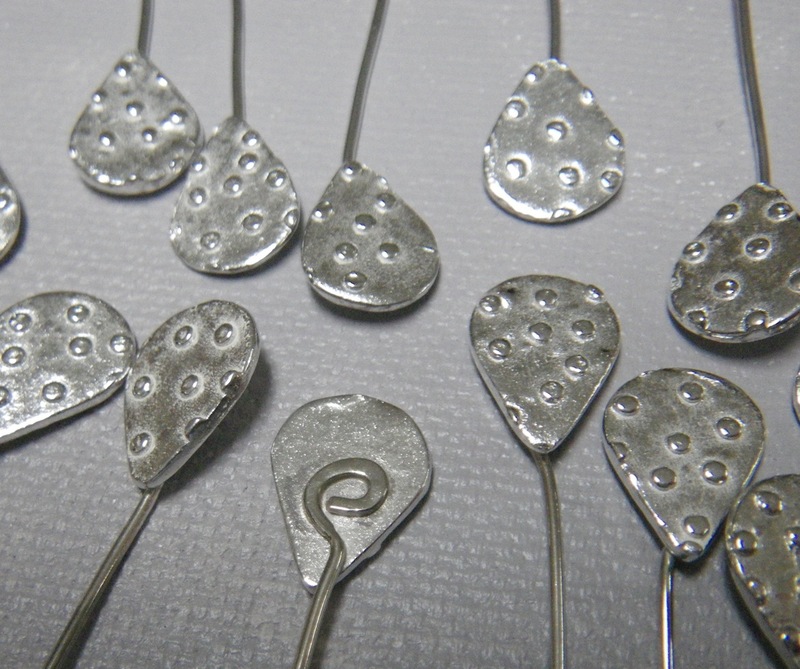 I have a number of designs in my head, but I wanted some silver components to include in the finished pieces. What a great feeling to get out my precious metal clay, start listening to a new book on CD, and spend a couple days cranking out some of the beads and components I’ll be using this week. Leaves are a recurring theme for me. I like the simple lines of the bunchberry leaf because it looks great on its own and it combines well with other shapes. So, the first components I made were from the familiar leaves that grow along the side of the road by my house. I also made several shapes of my hollow silver rock beads, and some flat and domed spacer beads. 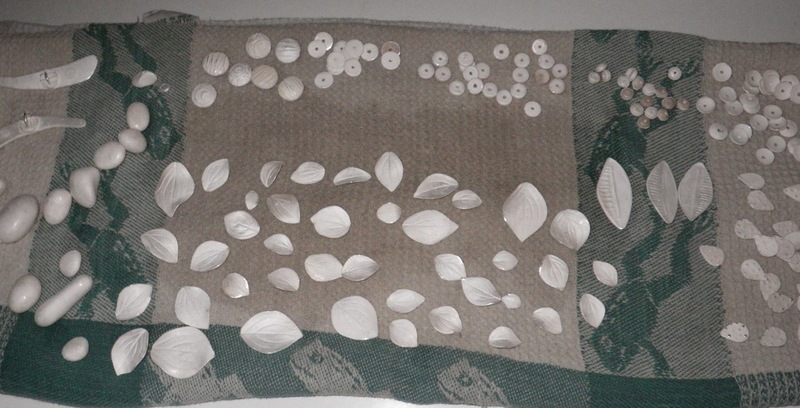 Here’s the kiln load, before any of the finishing steps. I know, the dish towel looks a little gross. Why make flat spacer beads with expensive PMC when they could be chopped out with a disc cutter? Because I can make them thicker than the gauge of sheet metal I would be able to cut out with a disc cutter, the holes are easy to drill before firing, and I make the flat spacers out of rehydrated PMC scraps. I can tumble them for a good long time and the edges will sparkle. I use the spacer for accents, so most of what you see are the edges. I’ve never been able to get that reconstituted clay to be as smooth as fresh clay. It doesn’t take a texture as well, and it is more porous. I learned this spacer trick from Fred Woell, and I use it a lot when I have old clay scraps I want to rehydrate. With this batch of components I also wanted to try something I read about on Vickie Hallmark’s blog. She has shared a lot of information about fusing Argentium with fine silver and sterling silver metal clay. (Argentium is sterling silver, but instead of sterling as an alloy of fine silver and copper, it is an alloy of fine silver and germanium.) I fuse Argentium wire to make my own closed jump rings and chains, but I have never tried fusing Argentium to any of my fired PMC pieces. 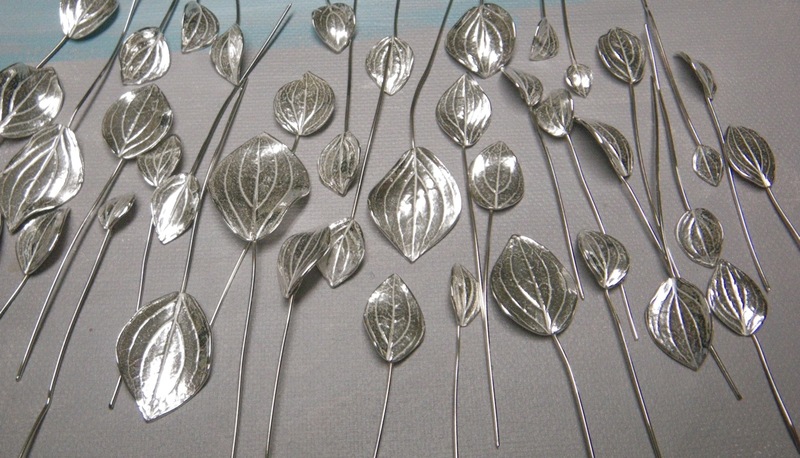 I used to solder the ends of sterling silver wire to the edges of these leaves to have an attached wire for making a wrapped loop of an earring. 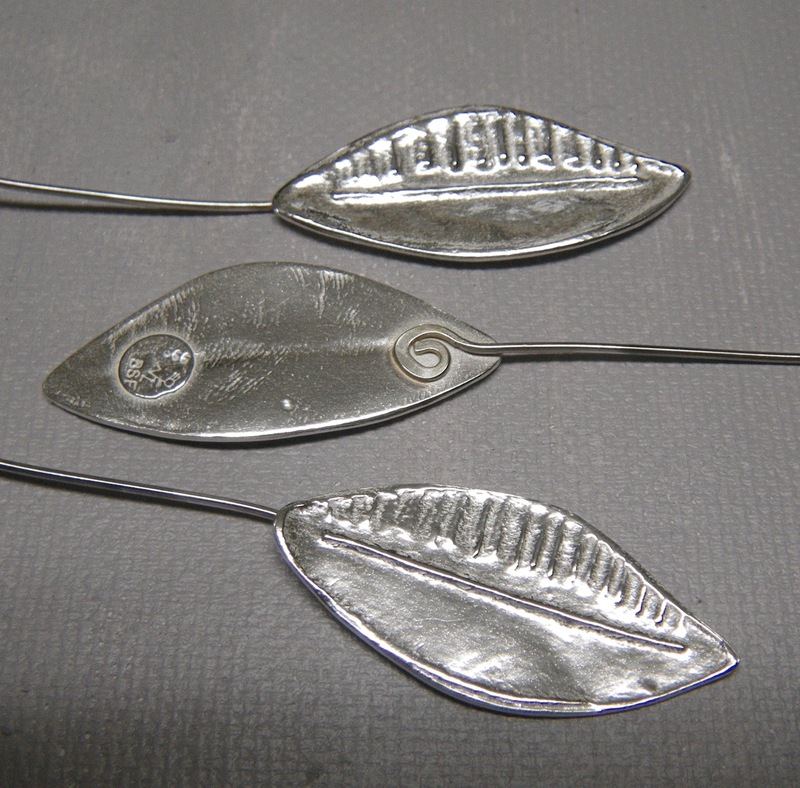 It was hard to hold the wire in place while waiting for the solder to flow, and I usually ended up with solder flowing onto the front of a few leaves. That is not where I would ever want to see it. (Oy, I hate to solder!) 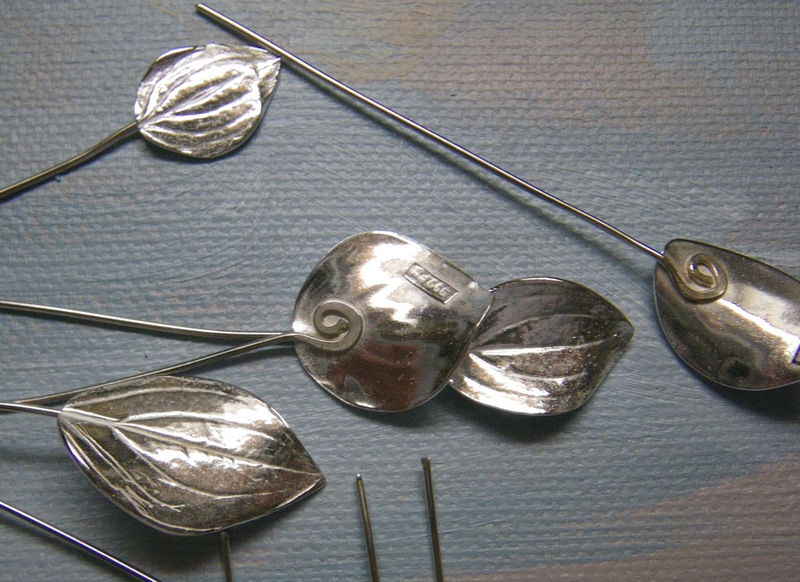 Then I tried imbedding fine silver wire in a small ball of clay at the back of the leaves so I could fire the wire in place, omitting the need for soldering. This worked okay, but it used more clay than I wanted on such a thin leaf, and the softer fine silver wire did not have the strength I wanted for an earring. Even with work hardening, there was a little weak spot where the wire went into the clay and I couldn’t reach it to harden with a hammer or burnisher. So today, I coiled a bunch of Argentium wire ends (20 ga), hammered them, and set them on top of the leaves on a fire brick, and fused them with my torch. There was a little trial and error with overheating the wire, but I quickly got the hang of it. 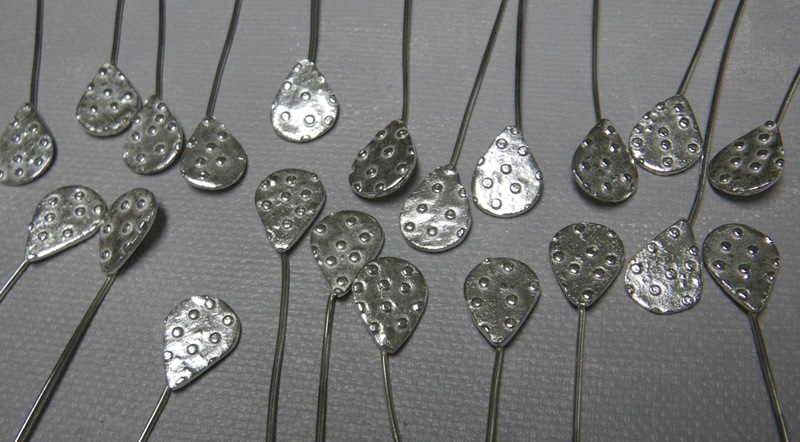 It was so much faster than soldering and so much stronger than imbedded fine silver. Tomorrow, these pieces will all get a little liver of sulfur bath and some hand polishing. Then they’ll be ready for jewelry action. Thank you Vickie Hallmark and everyone else who shares information so generously on their blogs! I have learned some of my favorite new techniques and gained so much inspiration from reading the blogs of other artists. I hope I am paying it forward with my own blog.